An acoustic isolating strip system used to prevent sound transfer through partitioning or party walls in all forms of construction where there is any point of contact. Suitable for new build, refurbishment / change of use, partition & party walls and floor joists. Bespoke: JCW Acoustic Isolation Strip is made to order 10LM rolls x any cut width up to 1000mm. Recycled: made from 5mm recycled rubber. 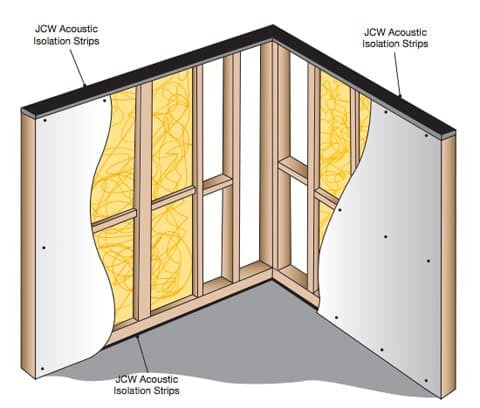 JCW Isolation Strips are typically used to isolate a timber Stud or Metal framed wall from the structure by sandwiching the Acoustic Isolation Strip/s between the floor, wall and/or ceiling and new wall construction. For DIY/single dwellings, JCW Isolation Strips can be placed on top of the joists to isolate the floor deck. Additionally JCW Isolation Strips should be placed around the wall perimeter to isolate the floor deck from the wall edges and the skirting boards from the decking.